Lauren flew in from where she lives on the West Coast. I was trying to find out about lutes and endeavoring to associate more with sounds - having lost my voice. I want to understand what a beautiful sound resembled so that focus was part of this study. 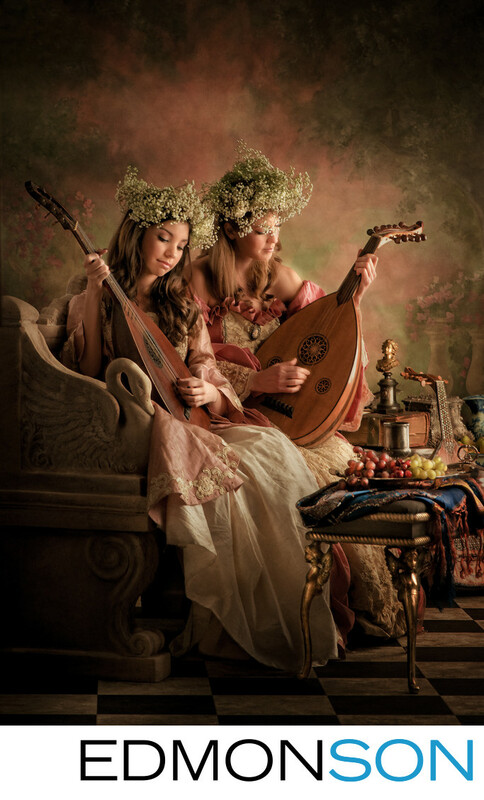 I purchased lutes for their love sounds and the love song. I wanted to continue this series of Tyler with her aunts so that every time she saw the images here, she would feel the security of our family nearby holding her close. I used the same bench I had made for Emily in the Vermeer series. I wanted a three-dimensional image that used natural light with large reflective mirrors behind them to bounce the light and scrims on the windows for a beautifully soft effect.